When the unassuming turn of phrase “unidentified flying object” was coined in the 1940s, it was intended to suggest that the objects in question were nothing more mysterious than a rogue weather balloon or an unfamiliar aircraft. UFOs have since become synonymous with aliens, from cartoon flying saucers, to abduction stories, to X-Files-style conspiracy theories – in the popular imagination their mystery has been solved, UFOs equal aliens, whether you’re a true believer or not. This unshakable association came to be despite the diligent work Dr. J. Allen Hynek, a scientist who became convinced that we truly could not identify some objects in our skies, and kept pushing throughout his life for a scientific explanation, while keeping open every possibility, some of them way further out there than little green men. Close Encounters Man: How One Man Made the World Believe in UFOs, a new book by Mark O’Connell, serves as a biography for both the modern UFO phenomenon and for Hynek, an astronomer and professor at Northwestern University who died over 30 years ago, but whose ideas make him one of the most surprising scientific figures of the 20th century. The book reveals an academic committed to rigorous, methodical study, but whose deep intellectual curiosity also harbored a mystical side, intrigued by Rudolf Steiner’s concept of “supersensible knowledge” and the idea of a universe composed of many dimensions. By the time of his death in 1986, he was much more interested in the idea that UFOs might be evidence of interdimensional overlap or proof of a Jungian collective conscience, than the comparatively quotidian concept that they are vehicles carrying visitors from faraway planets. Hynek’s struggle to properly inform the public through a dedication to the scientific method, while also embracing the very edges of what is possible strikes a chord today, in an era rife with deep mistrust of the government and of mainstream science. Conspiracy theories have moved from the fringe since we stopped agreeing on what constitutes a basic scientific fact, and there are more than a few big ones involving the coming alien takeover and of course, NASA, which sits at the intersection of science, government and outer space. Just last week a NASA spokesperson told The Daily Beast, in all seriousness, that the agency does not have child slaves laboring on Mars, in response to an InfoWars segment claiming otherwise. The Disclosure movement believes that governments around the world have already been in contact with alien intelligence and have suppressed this information from the public, and no, Trump would not be tweeting about it because the President is kept out of the loop in this scenario, says O’Connell. This is deep state stuff. Even the ever-pragmatic Hillary Clinton vowed to release classified information on UFOs and aliens while being interviewed by Jimmy Kimmel last year during her campaign. The unknown and how we go about knowing it is very much on our minds as a culture. Born a few days before Earth passed through the tail of Halley’s Comet in 1910, Hynek died just a few months after traveling through the comet’s wake again in 1986. He spent the interceding years as an astronomer who changed the field of celestial imaging by developing a high-altitude telescope and video telescope, founded the Corralitos Observatory in New Mexico, led a team that devised the first tracking system for satellites before there were any man-made objects in orbit, and reassured a nervous American public after the Russians launched Sputnik in 1957, which put him on the cover of Life magazine. Hynek was also one of the first scientists to evaluate UFO sightings for the U.S. Air Force, working on a series of classified projects in the 1950s and 1960s. 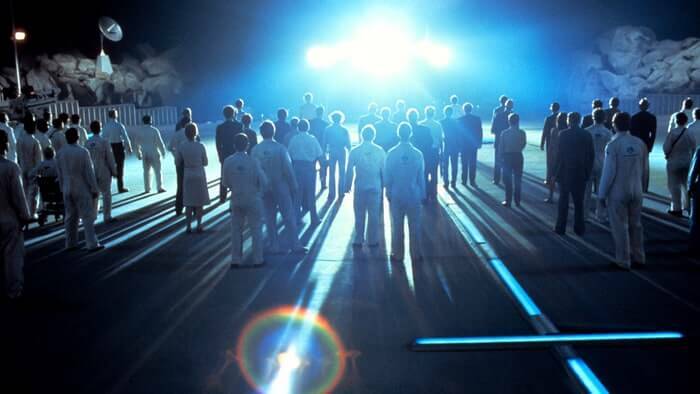 Though he started out a skeptic, he went on to found the J. Allen Hynek Center for UFO Studies, landing a cameo in Steven Spielberg’s 1977 hit, Close Encounters of the Third Kind after contacting the director when he learned that the film’s working title was drawn from his work. Even more than 30 years after his death, Hynek remains a controversial figure in UFOlogy, mainly because of his refusal to choose a side. O’Connell, a screenwriter and UFO history expert who writes the blog High Strangeness, has already had some of Hynek’s legacy rub off on his own reputation, which he takes as a sign that he is following in Hynek’s footsteps as an unbiased, open-minded researcher, rather than writing for one camp or another. Hynek proved to be a thorn in the government’s side when it came to investigating UFO reports, refusing to dismiss the unexplainable as the product of mass hysteria or unreliable witness testimony. Indeed, a great number of the seminal 20th century sightings that convinced Hynek that UFOs were worth further study involved highly credible witnesses, including airline and military pilots, law enforcement officers and Delbert Newhouse, a navy photographer who caught such an object on film in the Utah desert in 1952. Hynek though, refused to say that the strangeness of UFOs and UFO sightings proved they were alien spacecraft, which made him unpopular on the other side of the debate as well. An intellectual independent, he ended up sandwiched between the government, which demanded mundane explanations for sometimes fantastic sightings, and a public convinced that aliens walked among them. Throughout the heyday of UFO sightings, significant incidents, including reported contact with alien entities and their aircraft, frequently popped up in clusters, referred to as “flaps” by Hynek. Though the last flap occurred after Close Encounters of the Third Kind debuted in 1977, UFOs are having a moment right now, too. This year Spielberg’s film celebrates its 40th anniversary, and the 1947 sighting of “flying saucers” over the Cascade mountains in the Pacific Northwest by pilot Kevin Arnold, which is widely noted as the beginning of the modern UFO phenomenon, marks 70 years of celestial intrigue. The History Channel just picked up a scripted series about Project Blue Book, the UFO investigation project that Hynek led for the government in the 1950s and 60, with Robert Zemeckis as executive producer. And of course, there’s the matter of NASA’s secret slaves on Mars. Are we headed for a new flap? What he’s most interested in, beyond seeing Martin Freeman cast as Hynek – though he was amused by the thought of David Duchovny donning the professor’s signature goatee – is an embrace of Hynek’s balance of rigor and open-minded curiosity. Like Hynek himself, O’Connell wants to reposition the conversation about UFOs, as well as an agreement to adhere to the scientific method itself, back into the mainstream and plumb what might be possible, rather than single-mindedly trying to prove, or disprove the existence of aliens.